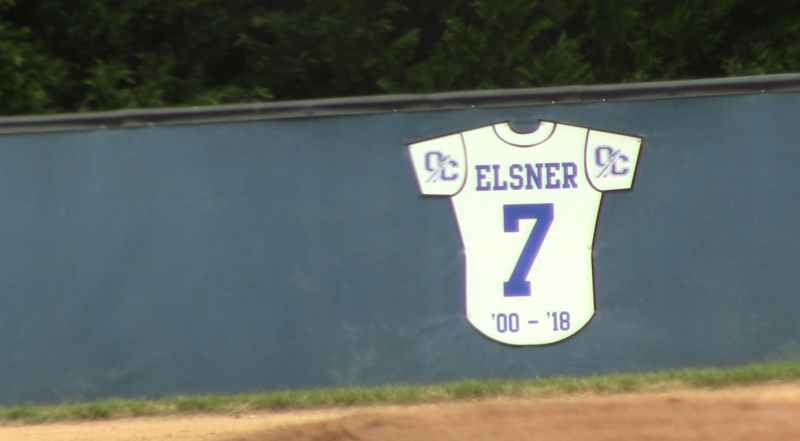 Prior to last night’s game, the Oconee County High School baseball team held a ceremony to honor former student and second baseman Sam Elsner. Elsner was killed in a car accident on July 12, 2018. He had graduated from OCHS two months earlier. Everything a warrior is supposed to be, Sam Elsner was,” said head baseball coach Thomas Gooch. Assistant Coach Blake Mooney said the outpouring at his funeral was indicative of the effect Elsner had on others. “Rain couldn’t hold back how many people were there. He touched a lot of lives, and he was just… words can’t really quantify what kind of person he was,” he said. Elsner’s entire family was in attendance, and they were welcomed onto the field at the beginning of the ceremony. Gooch began by describing Elsner’s impact on all the lives he touched. Team captain Luke Dickens spoke following Gooch. On behalf of the Elsner family, Sam’s cousin presented the team with a plaque to be hung in the facilities in remembrance. Elsner wore the number seven on his jersey, and Gooch announced that no one else would wear his number. A picture of his jersey was unveiled, hanging on the back, centerfield wall. Elsner’s three younger brothers threw out the first pitch. Elsner is in the minds and hearts of the players each day. A number seven with his last name is printed on a sticker on the back of each player’s helmet. Dani Terzer is a senior in journalism in the Grady College of Journalism and Mass Communication at the University of Georgia.